"The people who planned and committed this murder are wicked and cynical evildoers. They will get their deserts for what they've done. This is not only a shot in Nemtsov's back. This is a shot in Russia's back," Russian Human Rights Commissioner Ella Pamfilova told Interfax. "The killing of Vlad Listyev, Dima Kholodov, Anna Politkovskaya. The killing of Boris Nemtsov is among these high-profile murders," she said. Sergei Neverov, a deputy speaker of the Russian State Duma representing the United Russia party, said Duma members would carefully follow the investigation. "I would like to express my condolences to all of Boris Nemtsov's relatives and beloved ones. I knew him personally as a deputy prime minister in charge of the fuel and energy sector, as a State Duma deputy, and as an incumbent deputy of the Yaroslavl Regional Duma. This is a brazen crime committed in the center of Moscow, and we, as State Duma deputies, will carefully follow the course of the investigation," the United Russia press service quoted Neverov as saying. He said he had no doubts that those responsible for the crime would be found and punished. First Deputy Chairman of the State Duma and First Deputy Chairman of the Russian Communist Party Central Committee Ivan Melnikov sees Nemtsov's murder as a cruel act of provocation. "In fact, it is for the investigation to comment on the essence of the case. But from the political standpoint, if you analyze the timing and the prominent name's world outlook, this appears to be a cruel and bloody act of provocation organized for the same purposes for which the Boeing was shot down [over Ukraine]," Melnikov told Interfax. The goal is "to incite the public inside the country and heat up anti-Russian hysteria outside it," he said. Alexei Makarkin, first vice president of the Center for Political Technologies, is convinced that there are political motives behind Nemtsov's murder. "Of course, before the investigation is completed, it's necessary to refrain from any claims. Any reasoning about who is to blame may be speculative now. I wouldn't rule out very different options. But, certainly, this murder was committed for political motives," Makarkin told Interfax. Yevgeny Minchenko, the general director of the International Institute for Political Expertise (IIPE), believes Nemtsov's murder was arranged as a provocative act aimed against the Russian government to worsen the situation in the run up to an opposition rally slated for March 1. z"It is absolutely obviously an act of provocation aimed against the Russian authorities. This was done to shatter the situation before the March 1 action. This theory looks the most realistic one to me," Minchenko told Interfax. RPR-Parnas party Co-Chairman Mikhail Kasyanov said he was astounded by the killing of Nemtsov but had not heard from him about any threats he could have received. "I am looking at the body of my friend Boris Nemtsov. Four shots, he is dead. My friend was killed in the center of Moscow in the 21st century," Kasyanov, who visited the crime scene, told Interfax. "Could we have imagined that an opposition leader would be shot in the center of our city in the 21st century? This is a demonstrative and shocking murder," Kasyanov said. "We are in shock," he said. "We all live amid threats, but I did not hear about any particular ones, he didn't tell me anything," Kasyanov said. Yabloko party leader Sergei Mitrokhin believes Nemtsov's killing was a challenge to society and urged the authorities to catch both those who ordered the crime and those who committed it. "It is absolutely obvious that this is not an accidental but a political murder," Mitrokhin told Interfax. It is a matter of principle for the Russian leadership to make sure that all those responsible for Nemtsov's killing be found. "The matter is not even about the opposition now. Nemtsov's murder is a blow to our entire society and Russian statehood," he said. Yabloko party founder Grigory Yavlinsky offered condolences to Nemtsov's beloved ones. "Gravest crime. No words," Yavlinsky said on Twitter. He laid the political blame for the crime on the Russian leadership. Dmitry Gudkov, a State Duma deputy of the party A Just Russia, said he had talked with Nemtsov the day before his death, and the politician was in a good mood and did not express any concerns about his life. "I am simply in shock," Gudkov told Interfax. "I talked with him just yesterday in the evening - he was positive and cheerful, we talked about the march [planned for March 1]," he said. Policymaker Gennady Gudkov is sure that Nemtsov's murder was a contract hit and was politically motivated. "Even a low-ranking detective can understand that this was a contract killing. He was obviously followed, and the place was chosen so as to be able to run away quickly," Gudkov told Interfax. He presumed that the killing could have been arranged by an ultra-nationalistic organization linked to the events in Donbass. Nemtsov has lately been receiving anonymous threats, and his murder is politically motivated, as he had no enemies related to his private affairs, Solidarity movement activist and Nemtsov's associate Ilya Yashin told Interfax. "This is a political murder, which absolutely clearly is a contract killing. The murder has to do with Boris's opposition activities. One of the most prominent people in Russia's opposition has been killed so as to intimidate and horrify us," Yashin said. "This is precisely political activity, and nothing more," said Sergei Davidis, a leader of the December 5 Party and a member of the Solidarity movement that was headed by Nemtsov. Former Finance Minister Alexei Kudrin said, "Boris Nemtsov's murder is a horrible tragedy for the entire country." "It needs to be solved whatever it takes," Kudrin said on Twitter. "This is undeniably a political murder," Alexander Cherkasov, the head of the Memorial human rights center, told Interfax. Leading policymakers around the world have condemned Boris Nemtsov's murder and offered their condolences on his death. U.S. President Barack Obama issued a statement on the matter early on Saturday. "The United States condemns the brutal murder of Boris Nemtsov, and we call upon the Russian government to conduct a prompt, impartial, and transparent investigation into the circumstances of his murder and ensure that those responsible for this vicious killing are brought to justice," says Obama's statement circulated by the White House. NATO Deputy Secretary General Alexander Vershbow described Nemtsov's death as a tragic loss for those who value freedom in Russia. "Shocked by murder of opposition leader Boris Nemtsov," Vershbow said on Twitter early on Saturday. The UK Foreign Office also condemned Nemtsov's murder and said it would continue to follow the situation closely. "We are shocked and saddened by news that former Russian deputy prime minister Boris Nemtsov has been shot and killed in Moscow," a Foreign Office spokeswoman said in a statement. "I am shocked and appalled key opposition leader Boris #Nemtsov was shot. Killers must be brought to justice," Council of Europe Secretary General Thorbjorn Jagland said on Twitter. Head of the EU Delegation to Russia Vygaudas Usackas also said he had been shocked by the news about Nemtsov's killing. "I am shocked and don't believe that such a thing could have happened. My thoughts and prayers are with Boris's family, his friends and beloved ones. Those responsible must be found and brought to trial. I hope Russian authorities will act promptly," Usackas told Interfax. Ukrainian President Petro Poroshenko said he had no doubts that Nemtsov's killers would be found. "Shock. Boris killed. Hard to believe this. Have no doubts killers will be punished. Sooner or later. RIP," Poroshenko said on Twitter. Ukrainian Prime Minister Arseny Yatsenyuk said Nemtsov was a real patriot of Russia and a great friend of Ukraine. "A patriot of Russia and at the same time a great friend of Ukraine. This is exactly what Boris Nemtsov was like and what will remain of him in our memory," Yatsenyuk said on Twitter. In light of Boris Nemtsov's murder, the opposition canceled a march in the Moscow neighborhood of Maryino on March 1 and decided to hold a mourning procession the same day. "Because of what happened, we decided to cancel the anti-crisis march in Maryino planned for March 1. 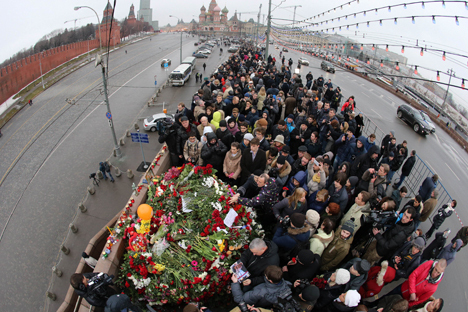 We will hold a mourning action in the center of Moscow the same day," Kasyanov told Interfax. Leonid Volkov, an opposition activist and Alexei Navalny's associate, also proposed that the march in Maryino be canceled and a mourning procession held in central Moscow. "We are in a new political reality. There is no place in it for a march with green balloons and flags in Maryino on March 1. A mourning procession in the center is to be held on March 1," Volkov said on Twitter. Boris Yefimovich Nemtsov was born on October 9, 1959. From 1991 to 1997, he served as governor of the Nizhny Novgorod region. In 1997-1998, Nemtsov was a deputy prime minister and a member of the Russian Security Council. In 1998, Nemtsov founded the Young Russia movement, which belonged to the Right Cause coalition and the Union of Right Forces party. He was elected to the State Duma in 1999 and became its deputy chairman. Following a split in the Union of Right Forces in 2008, he set up the Solidarity movement. Nemtsov was elected a deputy of the Yaroslavl Regional Duma on September 8, 2013.